From my very first WAR-TOYS trip, I've had few opportunities to work with the same children over multiple sessions. The reasons vary from deteriorating security situations (like in Gaza) to a lack of resources and/or access. Many organizations don't have ongoing psychosocial programs in which to integrate the project, and I wasn't in a position to create temporary workshops to fill in the gaps. To do this, I needed a dedicated art therapist, NGO support, and adequate funding. Happily, this year, everything came together. 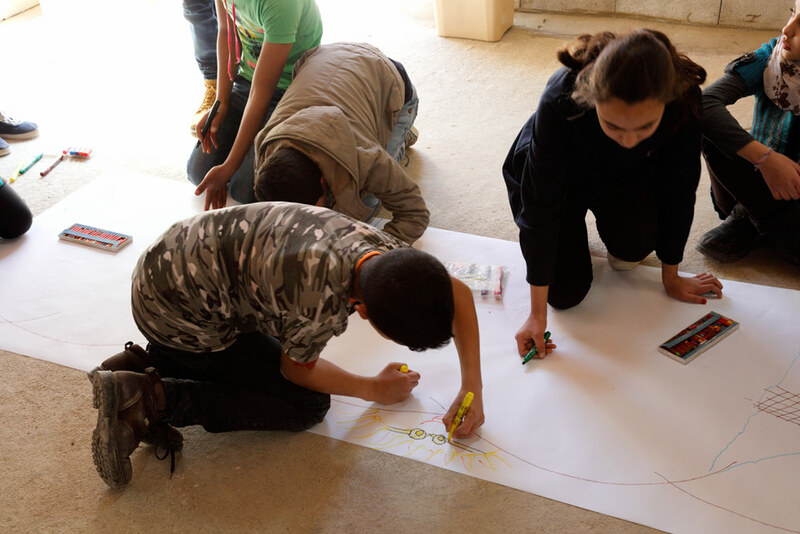 The Kayany Foundation provided an opportunity for Art Therapist Myra Saad and I to build a multi-day workshop for two groups of Syrian refugee children from their schools. Rather than continue with an interview-like format, we decided to experiment a little and created a program that culminated in collaborative group projects. Although many of the things shared in these sessions did lead to specific WAR-TOYS photos, that wasn't the goal. We wanted to engage the children in activities that promoted resilience and different ways of thinking. It was a chance to not only validate their perspectives on the past, but also challenge the children to envision a peaceful future. 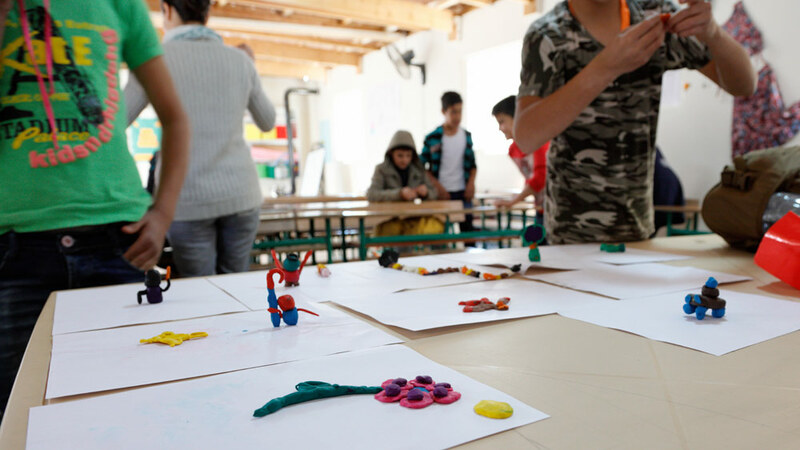 The core of the workshop was inviting children to collaboratively create two dioramas - one "bad" city and one "good" - using recycled materials and art supplies. The children would begin with the negative then work together to rebuild the positive. Before jumping in and building their dioramas in the second session, in the first, Myra took the groups through a series of activities intended to get them thinking and working with their hands. Myra warming up the first group with carefully designed games. Our first group was comprised of girls and boys (8-12 years old) from the Kuzbari-Rotary German School. 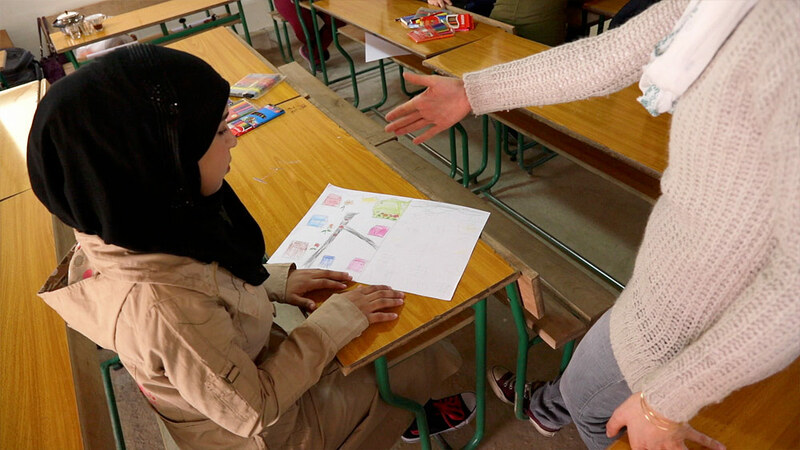 There were lots of familiar faces from the art-based interviews, conducted a few days before in the same classroom at the Malala Yousafzai School. After assembling the group and loosening them up with games, Myra set them on their first task: sculpt a creature with a positive super power. The results were as varied and colorful as one might expect with a lot of the children creating things that had a protective role. There were monster eaters and several magical items, including a flower that could fill everything around it with blooms and beautiful smells. With these powerful totems symbolically protecting them, the children were next asked to start visualizing "bad" cities through individual drawings. Many shared accounts of the places they had fled, while others imagined what Syria must be like now - filled with ghosts of dead soldiers and monsters roaming the streets. Mixed in with ghouls and other fictional creatures were people shot in the head. Clearly, the children were invoking their own memories and strong emotions behind thinly-veiled facades. In one drawing, the ghosts of dead parents still waited at home. 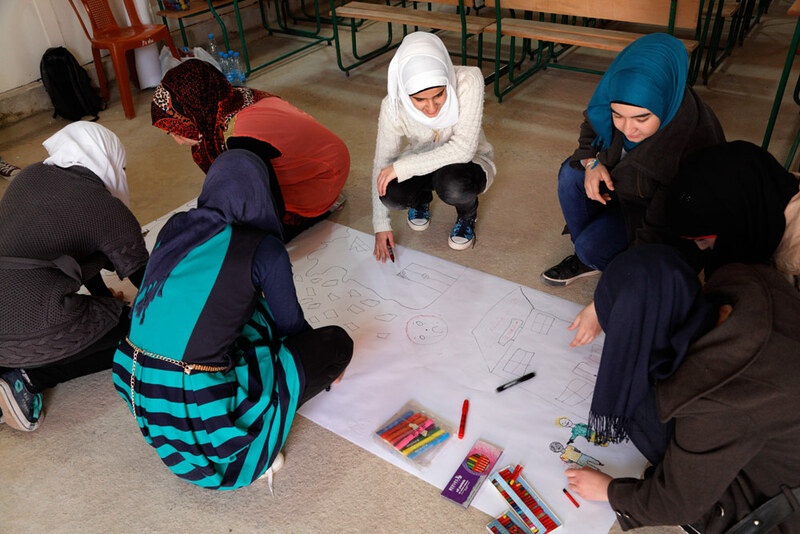 Instead of next asking the children to collaborate on one large "bad" city design (as had been planned), Myra sensed that the boys and girls needed something more positive to focus on for the second half of the session. She didn't want to leave the them with negative feelings until we met again a few days later and asked that they start working on their collaborative vision of a "good" city. A large sheet of paper was rolled out, and the boys and girls began working together in earnest, carving out spots for homes, a school, playground, swimming pool, river, and mountains. There were bikes and children on skateboards as well as trees and a happy sun overlooking everything. It was the polar opposite of the individual drawings from earlier. The session ended with a discussion about the inhabitants of the city and an introduction to guided meditation. As much as I like to give Myra grief for the inclusion of Enya, the music really did have a calming effect. The second group, each sculpting something that represents a positive aspect of herself. 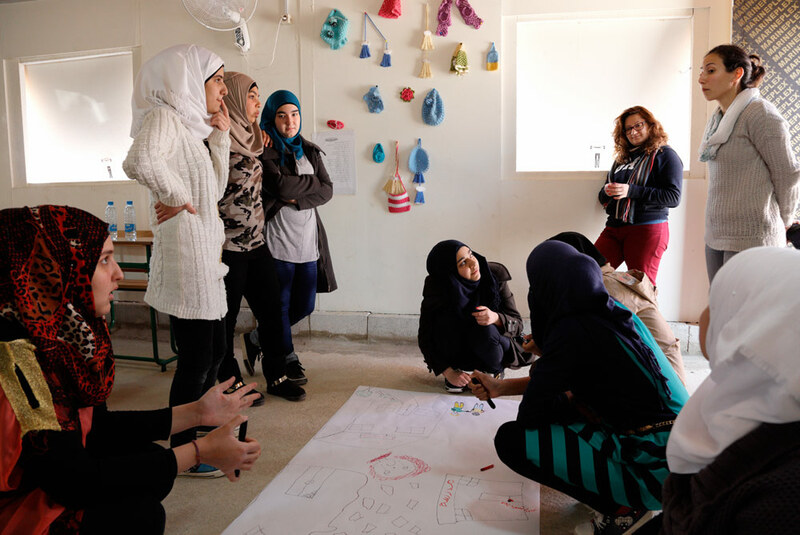 Our second session of the day was a smaller group of Syrian refugee girls (13-16 years old) from the Malala Yousafzai School. Like their younger peers, Myra and I knew most of them from our art-based interviews a few days before. Unlike the other group, they insisted that I participate in the warmup games (hence the lack of photos/footage). This goading to join in would become the norm in all of the sessions going forward, and for as many photos as I missed taking, I gained a lot more personally by participating. Gaps in the travelog are a small price to pay. 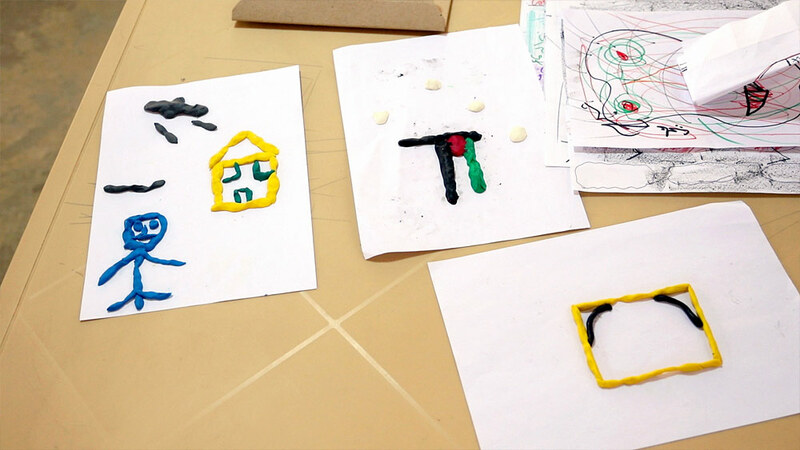 After the warmup, Myra modified the instructions for the older group and asked the girls to sculpt something that represented a positive aspect of themselves rather than create a fictional character. The results were powerful and varied, including representations of inner beauty (flower basket), a strong voice (mouth), Palestinian heritage (flag), and being a survivor (stick figure and airstrike). The girls were then asked to start thinking about "bad" places and create a drawing that captured what it looked like to them. Like the first group, many shared deeply personal accounts and feelings tied to Syria. 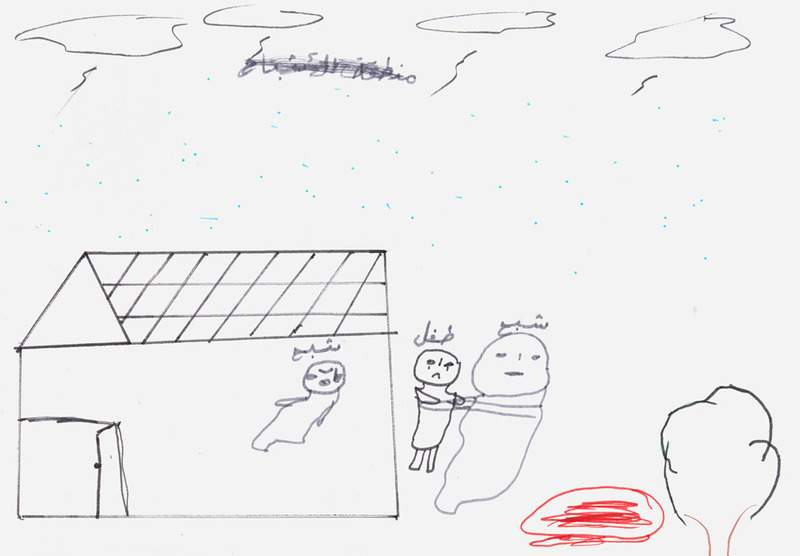 Seen below, one girl drew about running from tanks while family members were left behind and killed. Another showed the destruction of her once-beautiful neighborhood and wondered what, if anything, she had to go back to. Looking past the war, there was also a drawing of a woman being denied an education (diploma in middle) and forced to remain silent - her mouth sewn shut. After reassembling and checking in with the group, Myra let them decide what they'd like to collaboratively work on next - the "good" city or "bad." The girls chose to tackle the bad together, supporting each other as they debated and partitioned a single design across a large sheet of paper. In their city, children watched as people were killed in front of them, homes were destroyed, schools were closed, people were tortured and shot, and mothers cried for their dead husbands and children. Through a lengthy discussion about the city and its inhabitants, it was clear that this was a world that the girls knew well. There's a reason they and their families left their homes to become refugees. The next time we met, the girls would create dioramas based on their shared experiences, then transform them into something good. The results, seen in both their creations and the young women themselves, were remarkable to experience. As always, I look forward to sharing it. The session came to a close with another round of Myra's carefully designed games and my pressured participation. A hastily placed GoPro managed a few frames where I might have been caught having a lot of fun. Especially in places like this, it's important to laugh and occasionally make a fool of oneself. Happily, I was in great company. My thanks once again to the amazing children that participated, the Kayany Foundation, wonderful interns Ranine Swaid & Manal Bechara, and of course Myra Saad. Without her hard-earned talent and experience, this program wouldn't have been possible.